The first two species were formally considered conspecific (one species), and are sometimes separated in the genus Endomychura. Fossil remains of two prehistoric species are known: an undescribed Synthliboramphus sp. from the Late Miocene or Early Pliocene (c. 5 mya) of Cedros Island, Mexico, and Synthliboramphus rineyi from the Late Pliocene (around 3.5-2 mya) San Diego Formation of the southwestern USA. 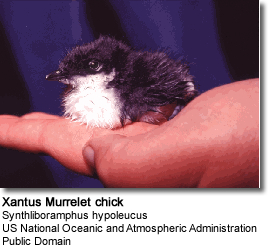 These birds breed in colonies, their eggs being laid directly amongst tree roots or in rock crevices. They are nocturnal on the breeding grounds, presumably to reduce predation, and for the same reason the precocial young are never fed at the nest, being taken to sea a couple of days after hatching. The parents call to the young from out at sea, and the chicks swim towards the adults who keep moving further out throughout the night. Synthliboramphus species disperse out to sea after breeding, with northern species migrating further south. 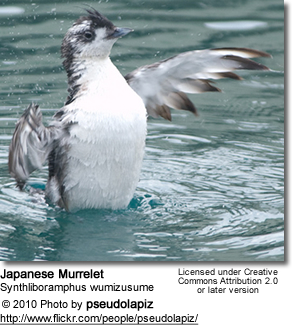 Synthliboramphus auks are small, with mainly black upper parts and white the short wings. These birds forage for food like other auks, by swimming underwater. They mainly eat fish, also some crustaceans and other small invertebrates.